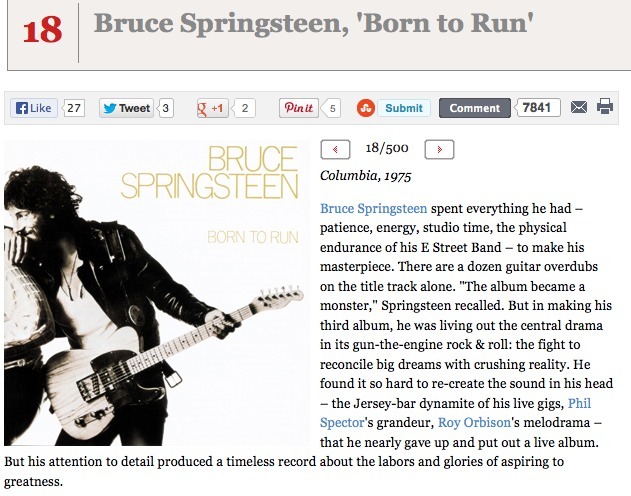 At number 18 in Rolling Stone Magazine’s 500 greatest albums is “Born to Run” by Bruce Springsteen. This was the first Bruce Springsteen album I ever owned. And the story behind my owning it is quite funny. I had bought it as a Christmas present for my then girlfriend, Christmas 1981. But just before Christmas she ran off with another boy, dumped me for him. So I kept the album, and I have to say I think I got the best of the deal, as it is still an album I listen to and like. The title track, which is also the opening track, has to be one of the best rock songs ever. It is Springsteen at his best. After this album I became quite a fan of Springsteen, and own 5 or 6 of his albums including “Darkness on the edge of town”, “The River”, “Born in the USA” and even “Nebraska”. I saw him live in Wembley Stadium in 1987, and it is one of the best concerts I have ever attended, he played for well over 2 hours and gave all he had to the performance. If you haven’t heard this album I highly recommend it. 123 years ago yesterday, on the 29th of July 1890, a troubled 37 year old took his own life. Vincent Van Gogh has gone on to be one of the most celebrated painters ever, and he is my personal favourite. I have been lucky enough to see the originals of many of his masterpieces, including the three here. 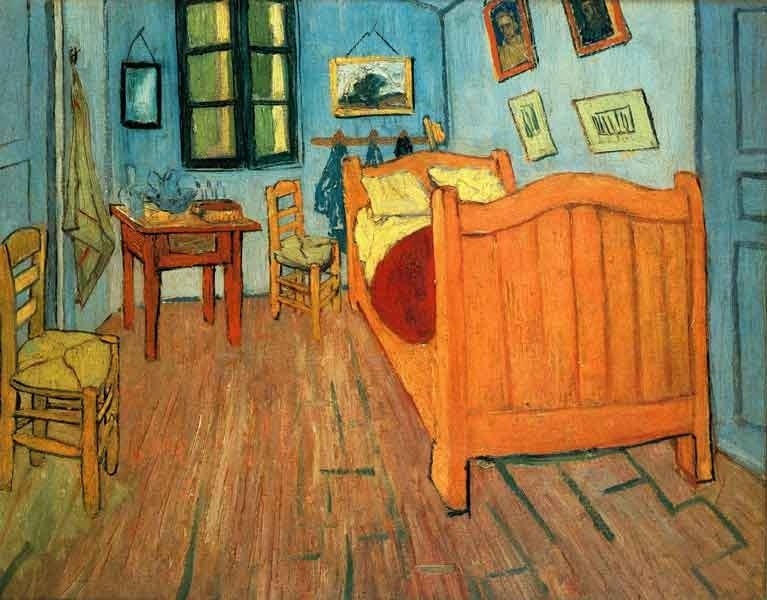 I’ve stood in awe in front of the second version of his painting of his bedroom in Arles at the Art Institute in Chicago, and the third version of this painting at the Musé D’Orsay in Paris. 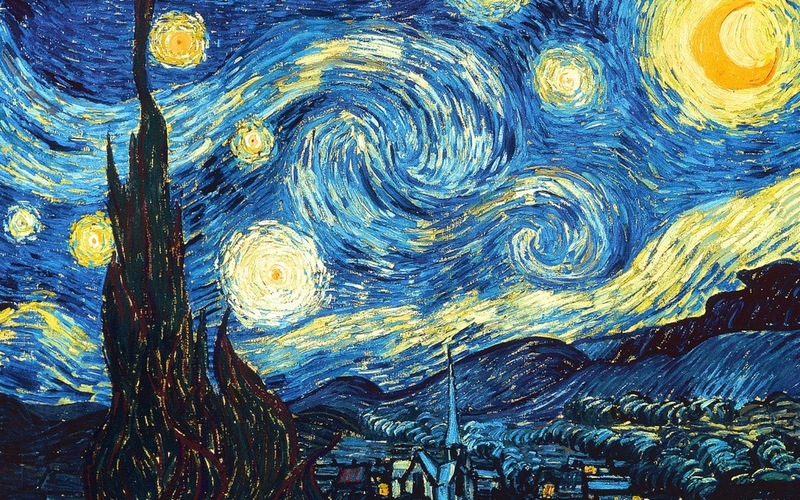 As an astronomer, one of my favourite paintings of Van Gogh is his “Starry night”. Again I have been lucky enough to stand in front of the original of this painting, at The Museum Of Modern Art (MOMA) in New York City. 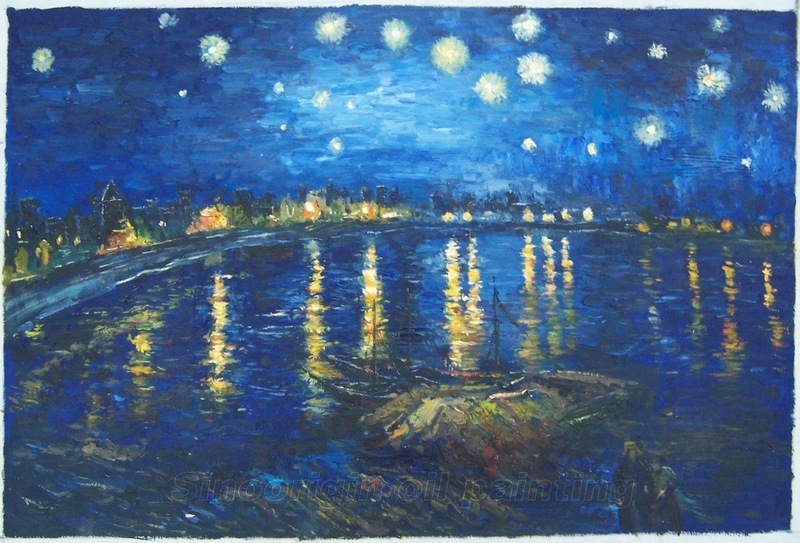 Another painting which shows The Plough (Big Dipper) over the Rhône is also on display at the Musé D’Orsay, and I saw it for the second time just over a month ago when I visited Paris. I thought I would include a YouTube link to this beautiful song by Don McLean, simply called “Vincent”. Which is your favourite Van Gogh painting? Don’t trust atoms – they make everything up! A few weeks ago a friend of mine posted this link to some “high brow” jokes, mainly science jokes. I found many of these jokes pretty funny, which I guess says something about me. Take a look and tell me which ones you like the most. Or, post your own in the comment section below. Neil Diamond is a phenomenal songwriter, he first came to prominence in the late 1960s through giving his songs to already established acts, so the Monkee’s “I’m a believer” is a Neil Diamond written song. He also wrote in the late 1960s the song “Red red wine”, which was a big hit for UB40 in the 1980s. 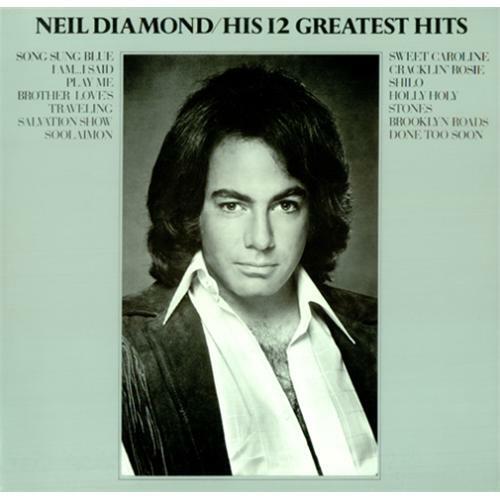 Neil Diamond is one of my favourite singer-songwriters. This is one of his most beautiful love songs, “Play Me”. At number 9 in The Guardian’s list of the 10 best physicists is Ernest Rutherford. Rutherford is on this list for two great achievements, discovering the atomic nucleus and understanding the process of radioactive decay. Rutherford was born in 1871 in Brightwater, a town near the northern coast of the South Island of New Zealand. He did his undergraduate degree at Canterbury College in Christchurch, New Zealand. Then, in 1895, Rutherford obtained a scholarship to go to do postgraduate studies at the Cavendish Laboratories at Cambridge University, England. After three years at the Cavendish laboratories, In 1898 Rutherford left Cambridge to go to McGill University in Canada. It was at McGill that he did his work on radioactive decay which won him the Nobel Prize for Chemistry in 1908. He was the sole recipient of the Chemistry prize in 1908, and was cited by the Swedish academy “”for his investigations into the disintegration of the elements, and the chemistry of radioactive substances”. 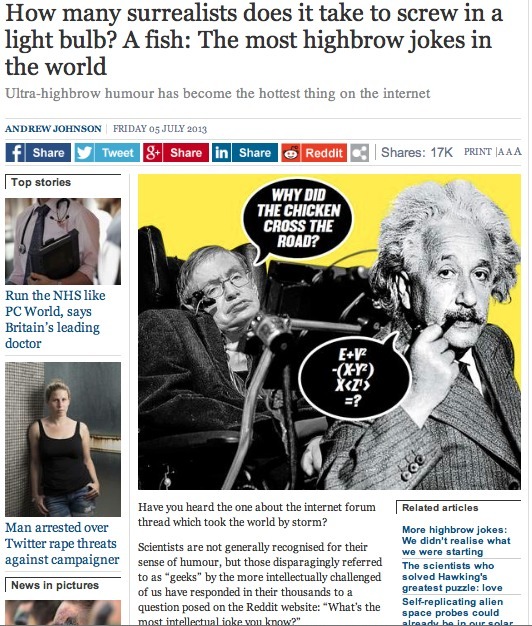 Ironically, although considered to be a physicist, Rutherford never won a Nobel Prize in physics. In 1907 Rutherford left McGill to take up a position as a Professor at Manchester University in England. It was whilst here that he discovered the atomic nucleus. In 1919 he left his position at Manchester University to take over as Director of the Cavendish Laboratories in Cambridge, a position that was held by J.J. Thomson, who had brought Rutherford from New Zealand back in 1895. In 1899, the year after he arrived at McGill, Rutherford was able to separate radioactive decay into two distinct types, which he called decay. 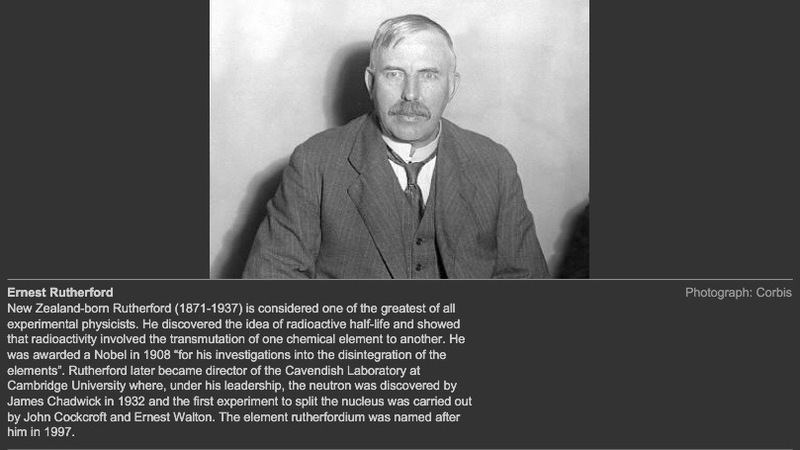 The following year a third type or radioactive emission was observed, and in 1903 Rutherford was able to show that this third type was a fundamentally new type of radiation which he called rays. In 1902, Rutherford published with his colleague Frederick Soddy a paper entitled “Theory of Atomic Disintigreation”. Rutherford and Soddy were able ot show in this 1902 paper that radioactivity involved the spontaneous disintegration of atoms into other types of atoms. For this work, Rutherford was awarded the 1908 Nobel Prize in Chemistry (not Physics!). Soddy would win the Nobel prize for Chemistry in 1921. Rutherford left McGill in 1907 to take up a Professorship at Manchester University, England. In 1909 Geiger and Marsden, under Rutherford’s direction, did an experiment which led to the discovery of the atomic nucleus. I will talk more about this experiment and how it showed atoms have nuclei in a future blog, but to briefly summarise the experiment what they found was alpha-particles bouncing back from a thin gold foil. This could not be explained by the plum pudding model of the atom that J.J. Thomson had proposed after Thomson had discovered the electron in 1897. Rutherford published in 1911 a paper explaining that the results of the Geiger-Marsden experiment fitted perfectly with a model of the atom that has the negatively charged and very low mass electrons orbiting a dense positively charged nucleus. If one were to represent an atom by the size of a football stadium, the electrons would be buzzing around where the stadium stands are. The nucleus would be way down in the centre, and on this scale would be about the size of a grain or rice. Thus an atom, and hence everything, is nearly entirely empty space! It was for these two paradigm-shifting discoveries about the properties of atoms that Rutherford gains his place in this “best 10 physicists” list. How do you rate his achievements? And, if Rutherford is in the list, shouldn’t Thomson, the discoverer of the electron, also be in the list? You can read more about Ernest Rutherford and the other physicists in this “10 best” list in our book 10 Physicists Who Transformed Our Understanding of the Universe. Click here for more details and to read some reviews. Before we discuss no. 19 in Rolling Stone Magazine’s 500 Greatest albums, let’s summarise the entries from 30 to 20. I have this album. 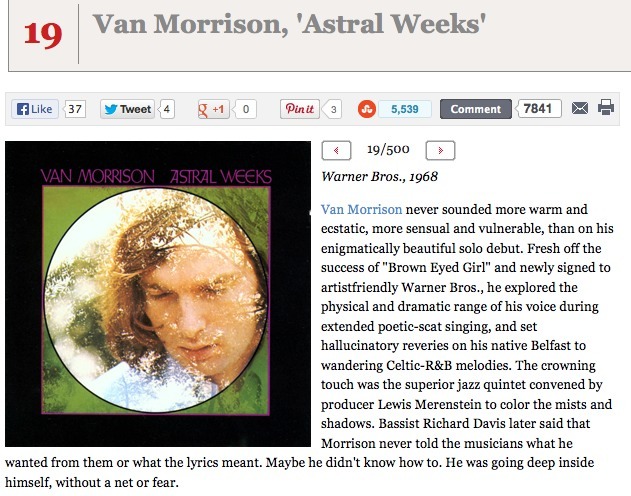 I bought it after I had bought a copy of Van Morrison’s Greatest Hits, and decided to find out more about his work. This is considered to be his best album by most critics. It was released in 1968 and, as one would expect from that time, is pretty hippyish. I like a number of the songs on this album, but I must admit my vinyl version has not been updated to a CD or mp3, and I have not listened to it in a while. Now is the time I guess to listen to it again through one of the streaming services. I have seen Van Morrison live, in a small pub in Newport (South Wales), which was a warm-up for a major arena tour. He didn’t say a word to the audience, just performed the songs. He seemed almost mechanical, switched off and just going through the motion of performing his songs. I was a little disappointed, he did not attempt to engage the audience so there was no real feeling of it being live. This is in stark contrast to Joni Mitchell, and I mention her because she is at number 30 in this list. When I saw her at the Hammersmith Odeon in 1984 she was wonderful, she chatted with the audience, told us the story behind a few of her songs etc. She created a real connection between herself and the audience. Which is your favourite Van Morrison album? Which is your favourite song of his? Who is the most engaging artist you have seen live? 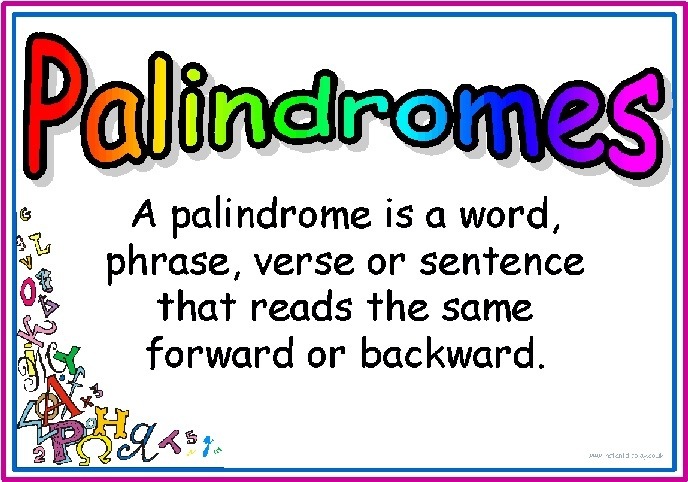 I love palindromes, I think there must be something about a love of mathematics, because palindromes are symmetric. As much as I love them, I am equally bad at remembering them. Here are a few that I either knew or were suggested on FaceBook a few days ago. Do you have any favourites? Add them into the comments section below.